All companies that hire new cdl grads have finish training. Trucking companies won't hire new cdl grads and just throw them to the wolves in that expensive equipment. New drivers get caught up with the companies schools push and don't realize there's 350,000 trucking companies in the USA. Schools usually push 4 or 5 companies to the students because it makes their job placement easier because they don't have to spend hours and hours researching for what's available. The smaller, less known companies I mention to people are real picky about who they hire from cdl schools, so to be accepted should be a high compliment; the bar is set high. Objectivity is the best approach when a newbie has narrowed their field to two or three finalists. And then out of the blue you reply with "check out ABC Company, they hire trainees." I could easily throw out other options to Buck weat, but that will only confuse him and compromise my role as a Moderator. experience with any of them? We discourage here say on TT. I think your heart is in the right place but forgive me, you seem to be on a mission to dissuade the newbie's from the Mega Carriers. (Am I the only one who is reading this pattern?). I have already suggested (asked) you to provide more details to Brett to include in the TT review wiki. Otherwise what you offer is little more than name dropping. We are here to offer proven options for the student prospect, options that are backed up with first hand experiences as shared in the diary section. OK,I get it. I have noticed there's about 4 posters that seem to control the website and to run afoul of them is a big no-no. There doesn't seem to be open discourse or room for fresh ideas. This is why you have so little participation on this forum and so many posts are years old with little to no response; "It's my way or the highway." I'll just log off now and won't return. Lots of changes since 2008. Where is your location, city/state? I had BCBS through the Teamsters and for a family of 4 it cost me $21.00 weekly. I didn't stay there long, but that's what it cost while I was there 8 yrs. ago. I'm sure it's much higher now, but still cheaper than non-union companies. We have a high and low plan...the first year I went for the cheaper one cause the insurance drops so much after the first year. I compared it to the obamacare offerings and for me it was better and cheaper than what they offered at the time. Again, most of the big carriers are going to be good. If you make a wrong choice for you then wait a year and change companies..it's not that long. Ignore the post just before this one. For some reason it mixed in with yours and difficult to figure out. PI&I Motor Express in Masury,OH is flatbed and Teamsters and hires new grads. Nick Strimbu Inc. has the better reputation though. If it were me, would go with Nick Strimbu Inc. reefer division, but that's me; you will decide what's best for you and your family. Not for the first few months solo. It took me probably three months of about $800 gross/$600 clear...this week was a slow week due to truck repairs but with detention and bonuses I ran 1726 miles. Grossed $907, take home $775. Last week I did like 2700+ miles and got $1300 gross, $1120 clear...something like that. It does differ week to week. Since I paid off the money I owed prime for my food advance, cat fee, locks and chains...I don't think I've cleared less than $500 even during home time. You said "training is solo not teams" what do you mean? At prime with your permit the dispatches are solo runs so the student drives the instructor sits next to you. You take a 10hr break like you would solo. After you get the CDL you run team for 30k miles. Its not fun...but the rewards are great. Yeah, I know it will be less when I start out. I was just wondering what I could expect the average would be once I settled in and got used to how things work. I don't think I would want the Northeast dedicated either. It sounds like good money, but I'm sure there are a lot of headaches that go along with it. I live in southern Ohio, so I probably wouldn't qualify anyway. I am married, so I will need the family insurance. My wife is checking to see when can get on her insurance, though. That might be cheaper in the long run. About the solo thing, it seems to be run like the PSD is for Prime - I would do most of the driving and the instructor would be in the jump seat. No one sleeps when the truck is moving - even though I have my CDL already. I think they said I would be out a minimum of three weeks (up to eight, if needed) like this. It is dispatched as a solo driver truck. I think one reason I like this is because it might be shorter time-wise than the 40,000 miles with Prime. But Prime does pay $700/week while training, and Maverick pays $550. Also, with winter here, I'm sure I would be more comfortable with someone more experienced in the truck with me when the snow flies, so Prime would be good for that for at least this winter. If you need good insurance for the family, look at a Teamsters company. 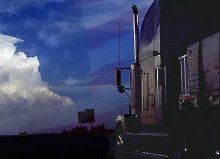 Nick Strimbu Inc is Teamsters and located in Brookfield,OH. They hire new CDL grads. They have flatbed & refrigerated and from what I know, the reefer division does lots of west coast runs which means more miles. Thanks for all of the replies/advice. It gives me a lot to think about. I have decided against Schneider mostly because they do not allow cell phone usage at all while driving - even Bluetooth. So now it is between Prime and Maverick. I like that prime has tanker, but I can switch to reefer if I don't like tanker. I like that Maverick has a $1,000 per week guarantee for reefer, and their training is dispatched as a solo - not team. Both seem to be great companies, and I'm sure I could be happy at either one. Rainy, could the average be close to $1,000/week at Prime if I went reefer? It looks like Dan E. probably got close to that in the tanker division. I know my earnings will depend on my performance and attitude, and I am eager to get started. I just want to make an informed decision, and everyone here is helping me tremendously, not only here in this post but everywhere I read on this awesome site. Anyone heard of Lobos Interstate Services? The feds closed that school. There's a trucking company now with the same name, but they only hire experienced drivers. The ad says, if you don't have a cdl, don't apply. They've definitely revamped their website but the information at the moment is unclear. They still have information up about student housing and getting your CDL through them. We'll keep an eye on it and see if they update it or check in here with us to verify anything. Thanks for the heads up Clayton. Obviously as you can see from this conversation we've had our eye on these guys for a long time and we've tried giving them some advice about how to run their school without putting students in a bad situation. I'm hoping they do indeed drop the schooling altogether. No one should come straight off the street, learn to drive a truck, and then immediately be thrust into the role of an owner operator. It's entirely too dangerous to put that kind of pressure on someone and there's no possible way you can know how to compete as a business owner in an industry you know nothing about. Find anything yet? BT Express Global Services.....PI&I Motor Express.....TransAm.....Carolina Cargo.....RoadTex Transportation....all these will probably hire you. TransAm and Carolina Cargo will hire you. TransAm hires if no DUI within last 24 mos. Hi Phil I am kind of in the same situation you were in. I was wondering did you ever land that trucking Job and if so is there any advice that you can give me. Covenant and Florida Beauty Express hire as far south as Miami. Florida Beauty Express leaves Miami with fresh flowers and runs to California with stops in between, then usually will reload to New York, then back to Miami. Hard work, but the benefit is you get unlimited time off between runs without worrying about losing your job. The drivers making the big bucks don't abuse that benefit. Yes, they hire new cdl grads. Seadragon, I don't think money's the real issue for South Florida. There's just not enough freight traffic to support drivers who want to do home time near the Everglades. Those interstate jobs are like hen's teeth. If you're moving to Tampa, then look at CTL Transportation. Excellent money in tankers. CTL will put you through their tanker school in Tampa. I'm almost to my final decision on which company I am going to go with! Those gyms are a recruiting tool. The office people probably love it though. Some drivers may not even see the terminal but a couple of times a year. Gyms look good on recruiting brochures though. Have you looked at Paul Transportation out of Tulsa? I agree with OS. You like the gym? And do you know how often you will get to use it? I get into our terminals once every six weeks or so. I know people who get to them three times a year. We have a great gym, and many other facilities but they are more like "extras" not the meat and potatoes for which to choose a company. Choose for home time, division, locale, cpm, pet policies, rider policies etc if that is what is important to you...because if what they offer is not want you are looking for but they have a great gym you never get to use....then what? Trucking companies with routes to Canada? They hire fresh out of school. They're picky though. Call their toll free number and they will confirm it. Flatbed division isn't too large, so they just have one trainer. I'm no recruiter and never have been; just interested and like to see new drivers get a good start since most of them think they only have 4 or 5 choices. They have dozens of choices. It's fun to throw a name out there to a new grad or student, that they've never heard of that hires new grads. Many companies don't keep the websites up to date on hiring criteria. Paul Transportation is one most haven't heard of that now hires new grads. Carolina Cargo and PI&I Motor Express hire guys fresh out of prison; I found that out from a newspaper article. This info helped a lot of men and women that needed a fresh start in life. That info isn't on the websites though, but it's a fact. Jones Bros. Trucking run to Canada and hires in your area..... System Transport and Britton Transport run to Canada. Schneider Bulk would be my choice. Full size trucks and good experience for the future with hazmat loads. Melton is one of the best flatbed outfits that hires new grads. Good luck. One of the top three; at least in my opinion. Out of state ticket doesn't appear on my driving record.... do I report it on my application? I'm from Robertson County, born and raised there. There's a good outfit in Hopkinsville; Bulkmatic, if you ever want a change. You forgot option 4. Join the military, serve your country and then be honorably discharged at the end of your contract. Thereby earning your education benefits. Use said education benefits to have Uncle Sam pay for your schooling, pay you while you go to schooling, then find a company that will pay you the tuition back that Uncle Sam shelled out. Not to mention choosing a company that has an apprenticeship program and continue collecting housing allowance payments from Uncle Sam while collecting your full pay at the company you work for.